University ApparelBy LeBlondeFox "This is a direct and unedited transcript from a recorded interview"
Meet the creative brains behind University Apparel; Jesse Gaarenstroom and Mark Jensen. It all started for them just chatting away at Uni, conversing about how they both wished they could wear something comfortable and stylish rather than your typical boring trackies and hoodies. BANG! 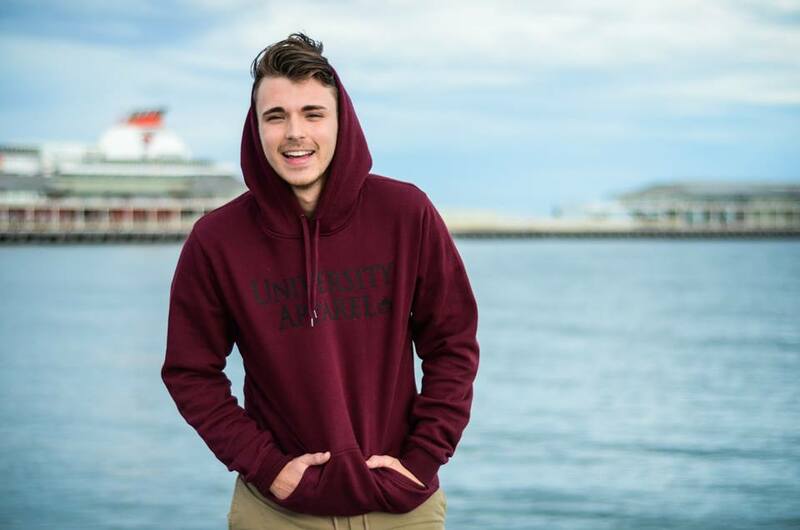 University Apparel was born, six months in and business is booming! These guys are Melbourne based and not in it for the money, but for students by the students. We all love a local Aussie brand at an affordable price tag. I was able to score a one to one interview with Jesse, with the man himself and discovered more about his up-coming Melbourne label. A) Hi Jesse, thank you for taking the time and coming for a coffee to chit chat about this exciting new brand you’re currently working on with Mark? J) No problem, let’s get started! A) What do you currently study Jesse? J) I’m currently studying Bachelor of Commerce (B.Com. ), Accounting, Finance & Financial Planning and working two jobs. It’s been a bit tough to juggle everything but, I love what I do! A) How did university apparel come about? J) Well Mark got me into this! It was his idea/brand first. We were at uni one day speaking about how we want fun and stylish comfortable clothing for university because when you go to uni you just want be in the best stylish comfortable clothing as possible especially after a big night out! A) What is your role at University Apparel? J) I control all the marketing and finance side but as well as coming up with ideas. There is more than two of us, actually about 4-5 people in the brand that also work behind the scenes like with the media/ pr and sourcing. A) Is your clothing made in Australia? Are they pre-made or made to order? J) The clothing is made in the states but is brought over from there and printed in Australia in a factory in NSW which then shipped to Melbourne The designs are done by Mark down here in Melbourne. It’s printed by a method called DTG direct to garment, its basically like a big printer which prints very high quality onto the clothing. A) How do you go about designing the clothing and the different pictures you have on your Uni and Street wear? J) Since we are only a new brand at the moment, we brainstorm ideas in a group to come up with the latest designs. Mark sometimes, on occasion sources designs and prints to purchase. A) So how does one go about creating their own fashion label or brand? Any advice? J) It’s not as easy as I’d love to make it out to be. Part of this industry is working with copywriters for the purpose of advertising or marketing your business. Another fundamental step to protect your ideas is to patent the product. This grants the creator (us) of original work and exclusive rights to use and distribute our brands, logos and other designs. A consulting contract is beneficial to the client- consultant relationship as this protects your project – this is a must and can be costly, but worthwhile. Once you figure out everything and get things into order, it somewhat gets a little bit easier from there on. A) What are your future plans for University Apparel? J) Eventually, we want to expand and create more designs and venture into jeans, hats, shorts, and create more unique choice of prints and designs. Just everything and anything! We just need to get our name out there, we have another forty to fifty designs which haven’t been made yet. So stay tuned! www.university-apparel.com.au. A pop up store will be held at Deakin University for O-week!